Marc Schubert is ready to roll on his new business after a fundraising campaign for a series of ice-cream-coloured dice amassed more than $30,000 in backing in just a few hours. The Edmonton educator, father and Dungeons & Dragons enthusiast is founder and CEO of Ice Cream Dice. 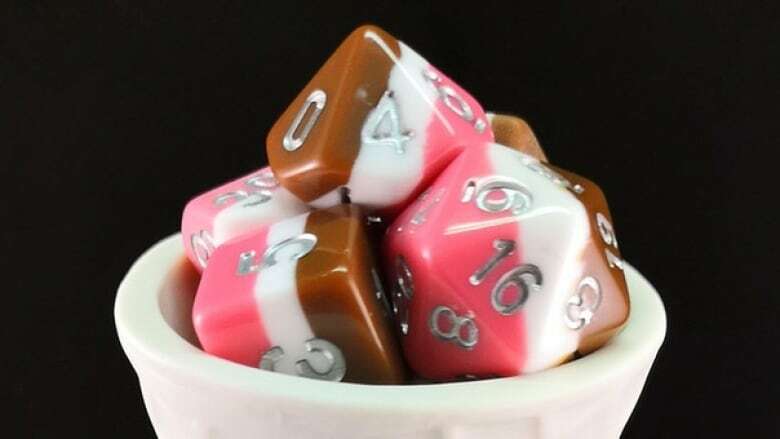 The line of dice, aimed at the tabletop role-playing games come in colours matching flavours including sherbet, Neapolitan and bubble candy. "I have had to consider seriously putting a disclaimer on them not to eat them," Schubert said in an interview with CBC Radio's Edmonton AM. A Kickstarter campaign for Schubert's new venture launched Tuesday. Enough people purchased his dice in advance that Schubert hit his $30,000 fundraising target in nine and half hours. With each set of dice coming in at $16, he's earned support from more than 1,200 individual backers. "I wasn't surprised that I hit my goal, I was definitely surprised that I hit my goal in half a day," Schubert said. "The day I launched, my wife called me from work and said, 'I should have taken the day off work.' She couldn't stop watching. "I was at home with my eight-month-old so I didn't have time to be glued to my computer screen which was probably for the best." Schubert doesn't feel the business is a gamble. There is a big community of players out there looking for a different kind of dice, he said. There is apparently a big appetite for his all-but-edible designs. As of Friday morning, more than $50,000 had been pledged to the campaign. Schubert, an educational assistant who works with kindergartners, is the founder of a non-profit society called the Forging Hero's Society, which aims to get young people involved in tabletop role-playing games like Dungeons & Dragons. Since founding his first student D&D club at Delton Elementary School in 2017, he has been supplying students and schools in the Edmonton area with everything they need to play or run role-playing games including rule books, battlemats, markers, miniatures and plenty of dice. He believes such games give kids a break from technology and helps them learn math and teamwork. Schubert said he got the idea for his almost-edible dice designs when sourcing supplies for the clubs. Many role-playing games often involve mythology, warfare, and black magic but he thought the dice could use a lighter touch. It's just one more way he hopes to get more people to play. "The community of role players is something that I'm humbled to be a part of and I want to do my part to further the inclusion of anyone and everyone in it," he said. "I kept seeing the same colours with different names and they just weren't fun. I wanted to make dice that were a little bit more joyful, a little bit more fun." Schubert expects the dice will begin arriving in his donors' mailboxes by the end of October. "With this being my first Kickstarter and my first product launch, I've built in a bit of a cushion for hiccups," he said. "Hopefully I've done enough of the legwork that I won't encounter any."